Quite often when you are writing tests it's necessary to store some data together with the testing project to make them available in the test functions. 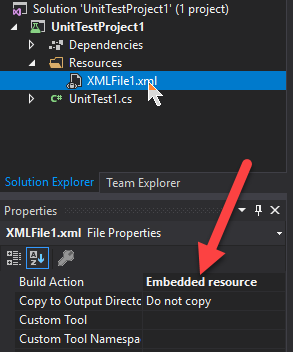 Mark them as "Embedded Resource"
After that, you can access any of these resources in any place of your testing module. To make it even simpler - we put these and some other functions to a Nuget package you can reference in your project.
.    .    .    .    .    .